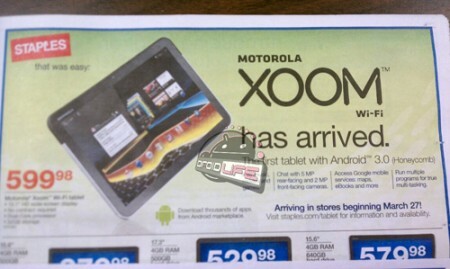 WiFi-Only Xoom Hitting Stores March 27 at $600? We got confirmation from Motorola’s Sanjay Jha last month that the WiFi version of the popular Xoom tablet would be launching with a $600 price tag. Well, according to the guys over at Electronista, the WiFi Xoom will indeed cost 600 clams, and they’ve even gotten a rumored release date: March 27. A leaked Staples flyer puts the Xoom up for sale on March 27, at $600, so it looks like we may just get what we want by the end of Q1. Again, this is only a rumor, so we advise you to take this with a grain of salt until we get an official word from Motorola. One has to wonder if the WiFi Xoom will launch with Flash 10.2, which will be rolling out to existing Xooms on Friday, March 18. If the rumor is legit, we can only hope that Moto will ship the WiFi Xoom with Flash 10.2 capabilities. More on this as it develops. Anyone planning to pick up a WiFi Xoom? Sound off in the comments below!